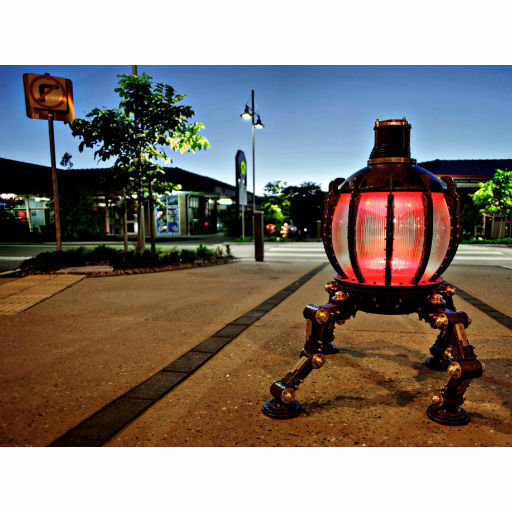 The Sunshine Coast Public Art Collection is constantly growing. Whether it is 'Sculptural Works'; 'Street Art'; or 'Integrated Works', public artworks are regarded as valuable assets, reflecting the essence of a community and forming part of a region's identity. These public artworks represent a commitment to creative pursuits and the beautification of streetscapes, while serving as a unique attraction to visitors and locals alike. Recently, hubby and I did two 'adventuring trips' - the Downtown Caloundra Street Art Trail and the Coolum Beach Public Art Trail - and the best thing of all is that these fun, outdoor treasure hunting activities are totally FREE and can be enjoyed by the whole family - including our furry four-pawed friends. 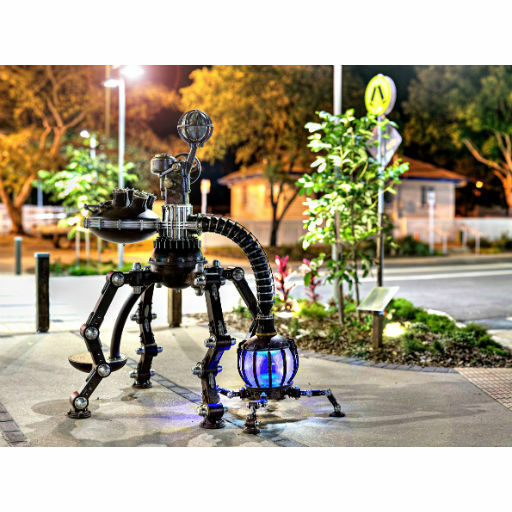 While not everybody may appreciate the public art dotted across the Sunshine Coast, there are quite a few artworks that bring a lot of pleasure and joy to all who see it, and more importantly, are freely accessible to everybody. 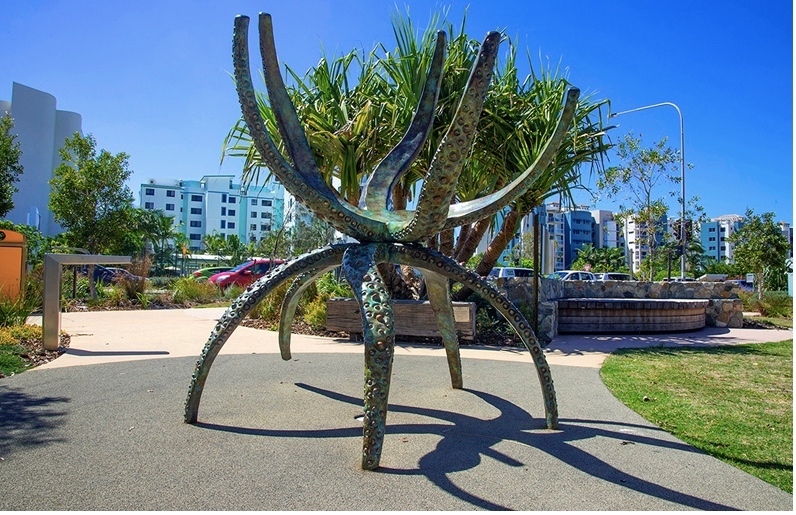 These ten must-see public artworks are not confined to galleries, which allows the public free anytime viewing pleasure, whilst creating a distinctive character for the Sunshine Coast. Oh my gosh, I just love, love, love this humungous sculpture of a child, doing a handstand - and very appropriately named 'iDIDIT'. I'm sure we've all been there as a child, or have experienced a child's joy at having accomplished the perfect handstand, to yell out triumphantly 'I did it, I dd it!'. You can't miss this six-metre rust-coloured steel sculpture in Birtinya outside the Sunshine Coast University Hospital - a magnificent piece of artwork by Maleny artist Russell Anderson. The playful and totally unique iDIDIT that bubbles with youthful energy, is an attraction for locals and visitors alike and is the outcome of a partnership with Oceanside Developers, Stockland. I would suggest a visit to the Impossible Machines, Impossible Solutions mural on a Sunday afternoon as the mural wall is within a public car park, which could prove to be fairly hectic during office hours. The artwork 'Ancestors' is a collaboration by Kirsten Cash and Lyndon Davis. What I particularly love with this artwork is that all three sculptural elements were created from one large Blackbutt log, roughly calculated to be more than two hundred years old and cured for over fifty years. Wow, can you imagine that! The three obelisk forms are grouped to create a feature artwork that elicits the image of indigenous clapping sticks and fish traps, whilst also managing to reference canoe and surf ski forms, which can be seen on the river every day. The main focus of the three 'Ancestors' forms with their natural style and the images they feature, is to enhance visitors' foreshore experience and to pay tribute to important fauna and flora, underscoring the cultural significance of these species to the Gubbi Gubbi, the traditional owners of this land. Lyndon Davis is a Gubbi Gubbi artist and the flora and fauna images that have been featured on the 'Ancestors' are cod, black swan, spoon bill and mud crab, together with Minti bush and water droplet motifs. The extremely popular Cotton Tree's ping pong tables received a high-contrast pop art mural make-over by local artist Gerrard King. Ping like a Bee, adds another layer of contemporary art to the urban fabric of Cotton Tree and Maroochydore. "My concept of using mouths, brushstrokes and bees, is meant to mimic the frenetic energy and noise of such a fast-paced sport. With the recent resurgence of all things retro, creating a pop art piece seemed natural," Mr King said. Get your ping pong gear out and enjoy a game on this very popular high-energy pavement mural. I just love the story behind this very futuristic-looking piece of art in Beerwah. Beerwah used to be the epicentre for hundreds of pineapple farms, with growers competing against each other and always on the lookout for ways to create bigger, sweeter and less spiky pineapples. Another important factor was to be 'first-to-market' with your fruit, which of course, will guarantee the best price early in the season. Artist Russell Anderson's inspiration for this artwork was a farmer who influenced the pineapple industry between 1931 and 1957 - 'Speedy' Joseph King. 'Speedy' always worked his pineapple patch on his own, never employing pickers. One day Speedy's field would be full of pineapples and the next day it would be totally bare. Nobody in the neighbourhood ever saw Speedy's pineapples leaving the farm, but somehow, they were always at market and yes, you've guessed it, ahead of everybody else. Many of the locals gossiped about Speedy's seemingly mystical gifts, but it wasn't until the late 1970's when Speedy's property was auctioned by the public trustee that his secret was discovered. The equipment sheds on Speedy's farm were filled to the brim with mechanical equipment and rather strange-looking machinery. The most advanced of this equipment appeared to be a matter transporter. From Speedy's journals, the functioning of the 'Apparatus for Expedient Market Deployment - Ananas Comosus' has been pieced together. This exceptional 'before its time' piece of equipment consisted of two parts - the isolation pods and the roving transporter. The isolation pods (four of these were found totally intact) appeared to be on autonomous walking machines that seek out ready-to-pick pineapples, squat over said ripe pineapples and then harvest them. Once the pineapple was contained, a light came on to indicate to the transporter that it was ready to move on. The roving transporter, operated by the farmer, would be driven to the pods location, lock onto the pineapple inside and then transfer its matter to a receiving crate at the Brisbane markets. It appears that these pods had a threefold purpose: finding ripe pineapples, picking them and then creating the right environment for matter relocation to occur. Once the contained pineapple had been transported, the pod then 'wandered off' in search of its next fruit. This whole incredibly ingenious system appears to have been powered by fuel acquired from farm waste. The most remarkable point of this story is that Joseph King aka Speedy managed to keep this absolutely brilliant invention to himself and didn't realise the implications behind such a very clever piece of machinery. Joseph King apparently disappeared in 1957, leaving no clue as to his whereabouts. Take a walk in the Sculpture Garden at Maroochy Regional Bushland Botanic Gardens, which has about thirty different artworks, that were created at the International Stone Sculpture Symposium held in 2005. Allow yourself at least half a day to enjoy the gardens and sculptures, including the new Whipbird Walk. The eighty-two hectare gardens of the Maroochy Regional Bushland Botanic Gardens have a magic and spirituality that seems to touch all who visit - a place where one can feel connected to nature and one another. 'Portal' by Simone Eisler, is one of a series of bronze artworks, reflecting the coastal and beach life of Marcoola - a link between the aquatic and the urban. This bronze artwork successfully complements other interactive works that are to be found throughout the pedestrian strip and Village Green. Together, these artworks allude to the beach, the rock pools and the ocean's micro-worlds. Portal provides a perfect 'I'll meet you' point, whilst providing a photo opportunity destination too. Children can spend hours climbing and exploring this interactive artwork. Hew Chee Fong is a very talented Hinterland artist, who was commissioned, together with LM Noonan to produce a gateway sculpture for the completed first stage of the Coolum Beautification Project. The very creative Dialogue is one of the public artworks that are on display within the Coolum Beach Public Art Trail. Located at the top end of Bulcock Street in Caloundra, Dingle Wall is part of the Downtown Caloundra Street Art Trail. Steven Bordonaro and Cassie Munson have very successfully transformed a once unsightly, graffiti-covered wall, into a stunning way-finding mural. Dingle Wall has been created to be a 'happy' wall, bringing a smile to the faces of all who see it and at the same time, instilling pride in the community. 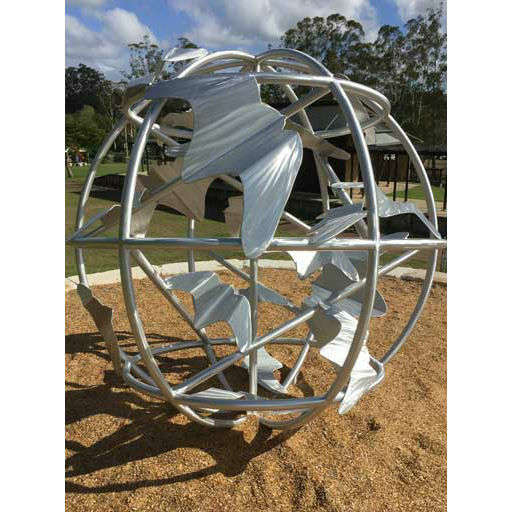 Meg Geer and Richard Thompson were the very creative artists with the winning sculpture, Spirit Orb, which stands on the hill in front of the Eumundi Town Amphitheatre. This interactive sculpture won the Eumundi Sculpture Prize in 2015, themed 'ANZAC Spirit: Yesterday, Today and Tomorrow', having been designed as a memorial to those who fought but also to invoke a sense of gratitude for the lives we enjoy today. The Spirit Orb was designed specifically with a slope in mind, giving it the appearance of rolling down a hill…but frozen in time, a reflection on young lives lost too soon. The twenty Eumundi ANZAC soldiers who sacrificed their lives are represented in the Spirit Orb by twenty birds, their spirits forever soaring. The Spirit Orb is an interactive work of art and children are encouraged to climb and play on it, symbolising a gesture of thanks to those that have fought to defend our freedom and way of life. You might notice that I have very specifically added by whom the funding for the various projects was provided. The reason for this is that in a lot of instances, artists receive a lot of criticism on social media over the 'waste of taxpayers money', despite the fact that in a lot of instances, developers have paid for them privately. iDIDIT is an example of an artwork being funded privately by a developer. While the council's investment in public art is comparatively small, the sky's the limit when it comes to private investment and council are in the process of educating developers to include a public art strategy as part of their development applications. This can include anything from unique seating designs to lighting elements - an incredible idea - hopefully we have many more free public artworks improving streetscapes and suburbia to look forward to in the not-too-distant future. Terrific article Elaine. I loved the 'Speedy' story. Thanks for alerting us to all this fantastic public art. Well done on gold award. Amazing art on Sunshine Coast. Nice way to spend a Sunday afternoon.